Your one-stop resource for management system references and training programs. 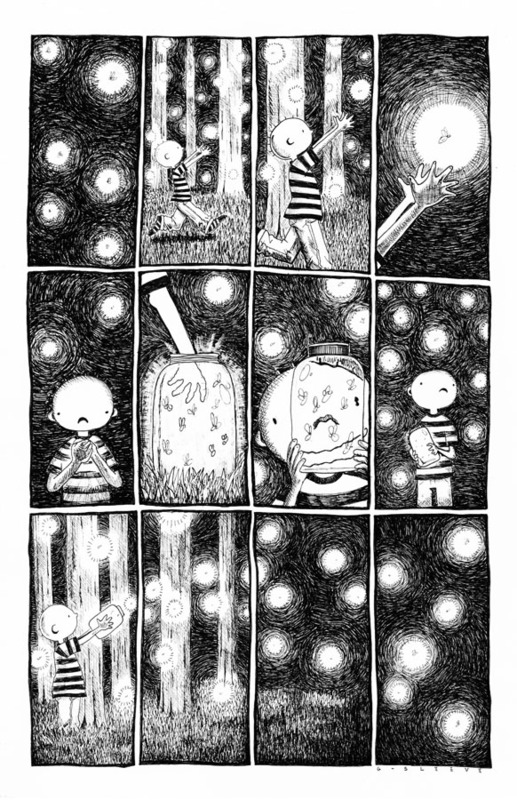 Home > G-sleeve Art > "Being a Kid" Prints by David > "Lightning Bugs"
The "Lightning Bug" print is one of nearly 100 vignettes drawn from the boyhood experiences of the artist, David Gildersleeve. This book is based on "actual" events. Click image to enlarge. Lightning bugs hold a particular fascination for young boys. They are magical as they flicker during the evening hours and appear and disappear at will. How can these tiny flying insects illuminate their surroundings and why? When captured and held in a quart mason jar, as all boys do at least once, they cast a glow that holds our attention and makes us marvel at the talent of Mother Nature. And when we release them and allow them to disappear into the night, still flickering, we enjoy a great sense of satisfaction that our benevolence brings. We are excited when we look at this reminder of such a magical moment! This print (11" x 17") is foam-core backed and suitable for framing, and is perfect for hanging in a boy's room. What boy wouldn't be excited to have this reminder of such a magical moment. And you and I can't help but think that – "I was once that boy!"